I don’t think I’ve ever really shared about my religious background on this blog. I don’t like to post anything controversial and don’t want to offend any of my readers who may not have the same beliefs. 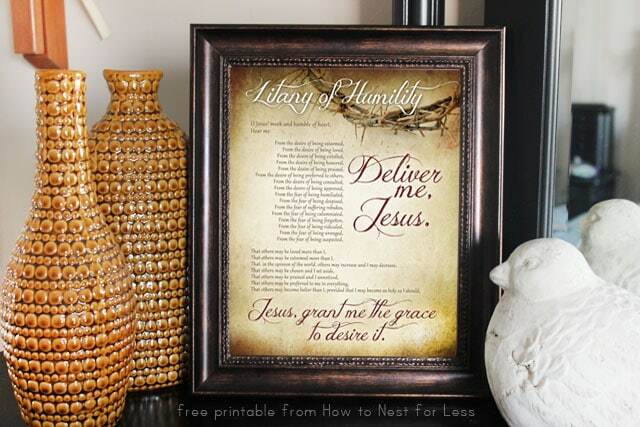 That being said… a friend’s husband asked me to create a printable for the Litany of Humility, a Catholic prayer for humbleness, for a Mother’s Day gift for his wife. I liked the final result so much that I decided to put it in my home, and now I’m sharing it with you today! Just click on the file to save to your desktop. Open and print on normal letter-sized paper. Trim and place in an 8×10 inch frame. That is just lovely. Thank you. Thanks so much Lisa! I have it framed on my fireplace mantel now. Love it! I adore this Erin! Thank you! This would look beautiful on our piano. Nice to see some works specifically for our catholic faith! Thank you for sharing. No offense taken here. What a beautiful prayer. I will be honored to display this in my home. Please do more like this. Thank you so much Shawne! Thank you for the sweet words, Sue. I hope you enjoy it! I am Catholic and I love this! Thanks so much for sharing. It’s so lovely that I’m going to print it out and frame it as you have. Thank you so much for sharing your faith (I’m Catholic, too! 😉 and for putting this printable out there for everyone who, like me, is looking to build a godly nest for less! May God Bless You! Thank you, Erin. This is beautiful. This is something I want to focus on this year, so your graphic came at exactly the right time. Thank you for posting this. I found this around Christmas time and have been enjoying it in my home and now I’d like to post a link to it in my sewing blog. I hope that’s ok with you. (It’s a very tiny blog so I doubt you’ll see much traffic from me – lol). Have a great day. 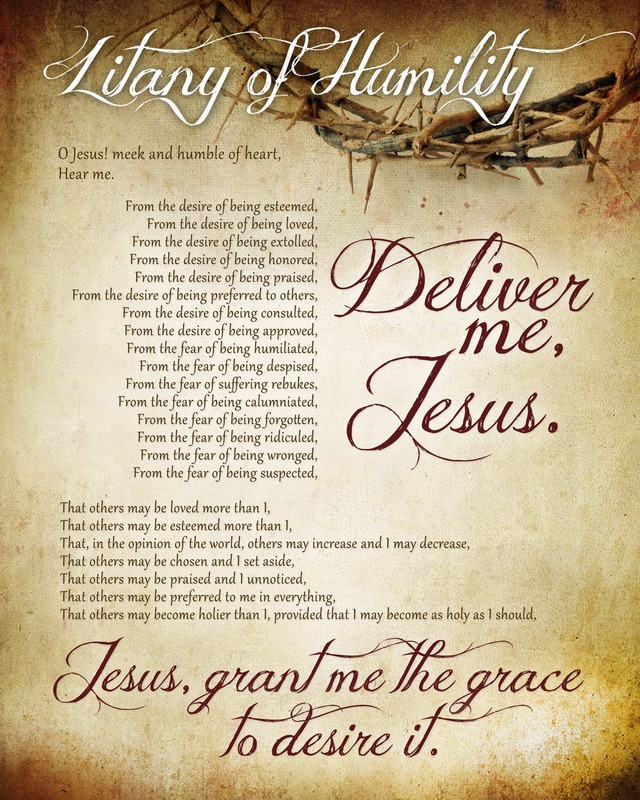 Thank you so much for this beautiful print for the Litany of Humility. A member of our Catholic couples group brought the prayer to our attention last year. I printed it 5×7 to keep in my purse for a daily prayer and plan to print copies for all our couples. Danielle Rose has set this prayer to music on her album I Thirst. You can listen to a sample at http://daniellerose.com/store/cds/i-thirst-cd/, a beautiful accompaniment to praying with your print. You’re welcome! And thanks for the link! You are just so talented it’s unbelieveable. Not to mention your generosity I love your printable. BEAUTIFUL!! Thank you for this! I will print it out and pray it daily! God bless you! Thank you for sharing this Litany of Humility. Your graphic design work is just as beautiful as the prayer. I am going to print copies out for my Catholic Bible Study group. We are studying Ephesians 3, and discussing St. Paul’s humility.